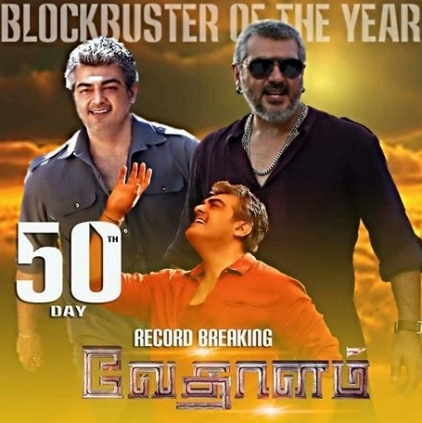 Today, Dec 29, marks the 50th day of this year's big Diwali winner Vedalam, starring Thala Ajith, Lakshmi Menon and Shruti Haasan in the lead roles. This film was directed by Siva and produced by A.M.Rathnam. Vedalam set a new record in Tamil cinema for the maximum Day 1 TN gross and has reportedly gone on to gross well over 100 crores worldwide. This is the highest grosser in Ajith's career and one among the best ever in Tamil cinema. The film has also done rousing business in the overseas space, particularly in Malaysia where it was unstoppable. Vedalam also marks back to back hits for the Ajith - Siva duo after Veeram last year, and they are set to join hands in 2016 too, for 'Thala 57'. We wish all the actors, technicians and workers who were a part of Vedalam, a film which has brought a smile to all the stakeholders concerned in every chain. Therikka Vittutanga!!! How Has Vedalam Fared At Vettri Theaters? People looking for online information on Vedalam, Vedalam 50 days will find this news story useful.